In this post: Festive & Frugal Christmas Porch Decor | Ideas for adding easy touches of Christmas to welcome your family and friends to your home. Welcome to our Christmas front porch…and Happy Sunday to you all. Before we get started, I’d like to chat for just a minute. Like most of you, I have been wandering around blogland taking Christmas tours. They are more beautiful and inspiring than ever before…but they can also be a bit disheartening. Some are so picture perfect that I wonder if people really do live that way? I will even go so far as to admit (grudgingly) that a few blogs actually made me depressed. There is just no way I can come even close to what is being posted by some bloggers. So…instead of drowning in the Sea of Comparison, I decided to take a piece of advice from Teddy Roosevelt. He wisely said “comparison is the thief of joy.” We certainly don’t want our joy stolen away. That would be dreadful. Here’s the deal. Everything you will be seeing here over the next few weeks will be do-able for anyone, simple and budget-friendly. Along with all of that, I promise everything will be festive and welcoming. I may fluff my pillows and pick up the dog toys but the rest of it will be authentic. At the end of the day, the most important thing to me is that when you visit here, you feel comfortable and happy. I want you to leave feeling inspired and ready to take on the world…not like throwing in the towel. OK…enough chatter…on with the porch tour! To switch things up a bit this year I went with a fresh pine bunch instead of a wreath on the door. Honestly, once I had it all bundled up and hanging on the door, I wondered if I had lost my mind. It looked a little rough around the edges. I wasn’t ready to admit defeat though so I added a buffalo plaid scarf and a string of bells. The last thing I did was trim a few random branches to tidy things up and when I stood back to look, I was pleasantly surprised! This could actually cost no money at all if you have access to pine trees and a spare scarf in the closet. I had to buy my greens but all together they were under $15.00. Instead of a scarf, you could use any kind of ribbon. Next was the doormat. I picked this up at Hobby Lobby when the Christmas decorations first appeared. For the olive buckets, I went with fresh pine trees from Lowe’s. They are pretty cute and the perfect size. When I was brain-storming for my red and black buffalo plaid plan, I knew I wanted to make repurposed shirt pillow covers for the porch. I thought I could find buffalo plaid flannel shirts at my Goodwill or as a last resort, on eBay. Ha! Boy, was I wrong. The vintage buffalo plaid shirts on eBay are definitely NOT cheap. They must be in high demand. When I struck out, it occurred to me that the shirts didn’t have to be vintage. So I hopped online and found some shirts on Amazon. They were not the deal you would get at Goodwill, but they were significantly cheaper than the vintage treasures on eBay…and they made the most darling pillow covers. I tied small bunches of pine to the backs of the rockers. For the table I piled an enamelware tub with giant pine cones and faux cranberries. Doing this porch was fun and the red really pops from the street. I wish I could have taken photos with a dusting of snow on everything but no such luck. It’s cold enough though for the fresh pine to easily last until Christmas. The holiday season is in full swing. The next few weeks will be busy for everyone but I hope you enjoy the hustle and bustle…at least a little. I’ll see you soon…in the meantime, may your days be merry and bright. click the image below. There are two other buffalo plaid projects and some printables. Your porch looks great! I love all the little touches you added, it really makes it stand out. Great idea on the pillows. Ann, another great Xmas. Although we are in the middle of summer and very hot at that here in Australia, we still love the traditional touches you bring and I especially love simplicity when we are so busy at this time. Merry Christmas to you and your family. I love your porch. It looks very festive and inviting. Your flannel shirt pillows turned out great. I just have to tell you that one year I filled a bowl with pine cones and acorns (in the fall). The next morning, it had been pretty much emptied by “critters”. I hope that doesn’t happen to your lovely bowl. So far so good Patricia! The squirrels have left the pine cones alone. I hope you are well and best wishes for a Merry Christmas! Thank you Ann for this post! I’ve been super discouraged with trying to do any winter decorating. Everything is just so over the top and so… well, just not me. I love the enamelware tub with the greenery and berries. Exactly what I’m going to do on my porch! Thank you! I know what you mean Ann and although I’ve managed to create some expensive looks in both of my own places, pretty much everything was done on a budget…free, recycled or on deep discount. It can be done and I have always done my own thing anyway. Your porch looks yummy and welcoming to me! Well said, and your porch is adorable! Thank you for ideas that are doable and so cute. Lovely porch, Ann. I really like your pillows. Such festive simplicity that says welcome, how inviting. Authentic, not over staged, nor expensive. Your creativity is always inspiring, and your humility and honesty is always a blessing of joy. Merry Christmas! Amen! I am right with you. My décor is simple with a lot of natural thrown in. I love the looks of your porch. The red and black are perfect! Thanks for sharing what really matters!! So easy to get caught up with unrealistic expectations and comparisons!! By the way, I truly enjoy your blog!! 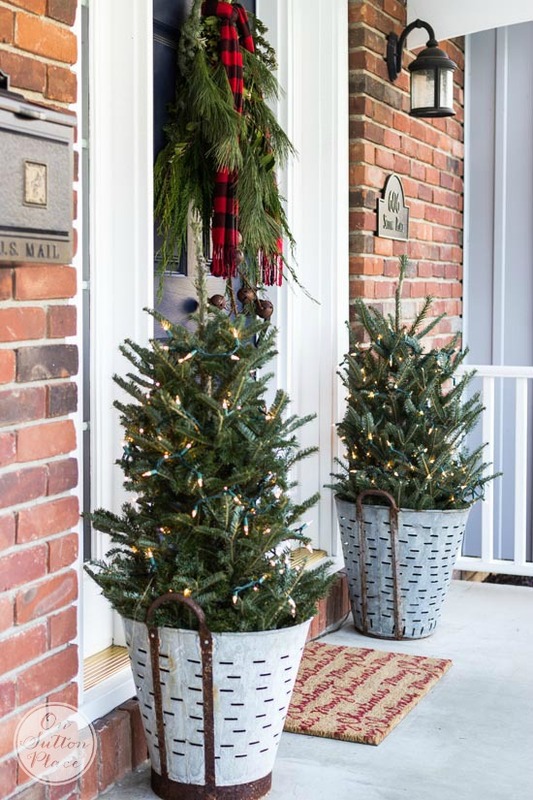 Your porch looks, festive and inviting. Thanks for sharing! I love your porch! I have been overwhelmed by blogland lately, too. My porch is still a work in progress, but we must have been thinking along the same lines. I have two black wicker chairs and I made red and black buffalo plaid covers for the cushions. I used plush fabric from JoAnn and made big fluffy black pom poms for the corners. 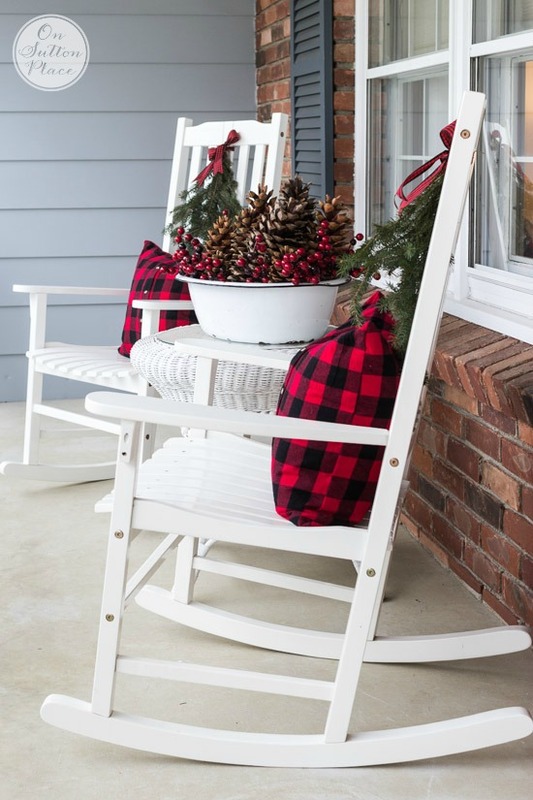 I have a black bench on the porch and there is a red wire basket filled with large and small fabric balls – some red, some buffalo plaid – that I got at a local shop last year. I have double front doors which can be problematic when decorating, but I found some simple wreaths at Target. It’s all coming together! I could just say Ditto to everything that has been said. There are such beautiful things out there in blogland it can be depressing, but ….there are those out there like you my dear friend (and yes even though we don’t officially know each other I consider you my friend) that are sensible. So many of us have other commitments that make it difficult to find the time to be the “be-all and end-all” of holiday decorating. I take your approach to almost all you do as a life lesson. Decorating shouldn’t have be over the top to be pristine and beautiful. But moreover, It should bring you joy. Thank you for all you do Ann. Merry Merry Christmas! Ann, thank you for this wonderful, timely post. Every year I eagerly await all of the beautiful home tours in blogland, and every year I come away depressed that my home could never in a million years look like some of the homes out there. BTW, your home is every bit as gorgeous as the homes you talk about, without being over the top – that’s why I love it! It’s difficult to find that line between just right and looking like Christmas exploded in one’s house. You nail it. Every single time. That porch is beautiful! I wish I could tell you what it is I love so much about your home, but I can’t seem to find the words. It’s just so – crisp and refreshing? It truly is like a breath of fresh air and I love the way you bring your colors and patterns together. 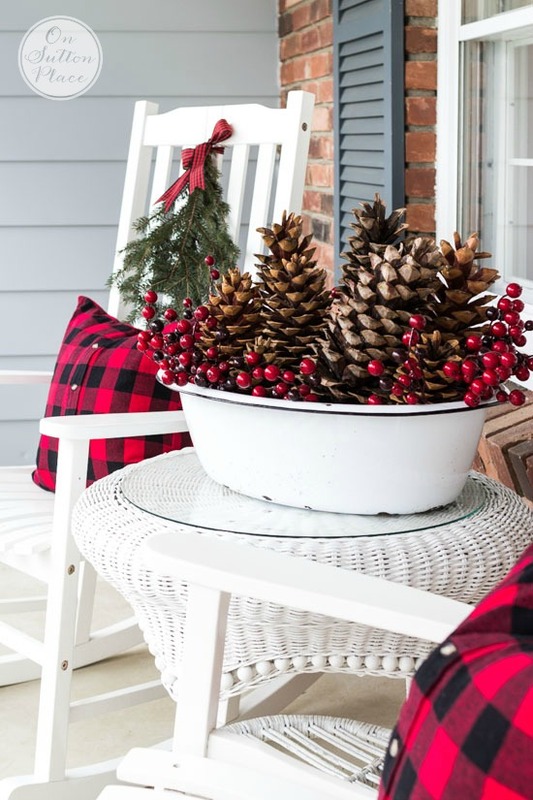 I found your blog on a Christmas home tour a few years back (the year you had the gorgeous sugar pinecones on your stair garland) and it has been my favorite ever since – it’s always the last one I read because I’m one of the people that likes to save the best for last. Ann you surprise me girl. And I am very thankful you put the phrase in from Teddy Roosevelt. Never ever let anyone or anything steal your joy. We are children of the King and how blessed we are. I Love love love your decor sense. I have to tell you. There is girl in my Bible study class that always has seemed a little duplicity. She came by my home one evening.g and I was painting a Landscape timber Santa. She begged me to maker her one and told me she didn’t like all the fussy decor at Christmas but loved woodsy homemade things. Well now I just lover her and we have a great bond. Our homemade decorations. She even told me she goes out in the worlds and picks up stuff then spray paints. Great idea. We all appreciate you so very much. What I did for my pillows went to discount store and bought a blanket very cheap and plenty of fabric for my pillows. Please forgive the errors in my previous email. My kindle has a mind of it’s own. Gorgeous porch!! I I’m in love with those pillows & the gorgeous lights!!! I think the hustle & bustle is kinda fun for the holidays,..maybe it’s just me haha! Hello Ann, your post could not have come at a better time for me. I usually get (over) excited about Christmas and decorating, reading and looking at masses of pictures in books and on Pinterest. It then follows that I get overwhelmed and despondent as I know I have no chance of replicating some of the fantastic houses. Your post has calmed me down and I can now continue in my own little way in the knowledge that my family loves everything I do anyway. Thank you for all of your inspirational posts. I love watching you prepare for the festive season in a radically different climate to ours. Today, as I am trying to tidy my garden & get things looking nice & cool by putting straw on the beds, it is 39′ with the wind rising. At least this year in the part of NSW, Australia, where I live, we have water as we had great rains in the winter. Last year we watered till Christmas then needed to greatly ration & sacrifice lawns to save trees & shrubs. I think your home looks so elegant & sparkling & never overdone. I won’t do a big clean-up just yet as the grain trucks are still going past the house. One of my granddaughters & a niece helped put our tree up yesterday with my 91 year old Mum offering comments during the process – so much nicer than doing it by myself. Same sentiment it helps to let me feel it’s ok not to have the extra. But by reading yours and thes others I have been having a lot of inspiration to reuse what I can. Thank you for being real and sincere.. I love your front porch.Its very welcoming. Loving the plaids and all your ideas! Thanks for sharing. What a lovely welcoming porch. Your posts are lovely and I love your ideas. Hi Ann, I’m so happy you addressed the beyond-perfection Christmas tours that we’ve all been seeing. I’m having my own tomorrow, and it’s real, it’s simple, and it’s inexpensive. If you can, I would love to have you come over and see my new blog design and what I’ve been up to. (I haven’t been able to do watercolors in quite awhile :( ) I also LOVE your porch, especially with the red buffalo check! We downsized just over two years ago to a condo and we have such a tiny porch now! I think in any decorating, holiday or not, it needs to be kept true to who we are, within our own budgets, and not doing it to impress the world, but to make us happy in our own homes. You do it right and that’s why I love following you! How creative! I too grabbed some buffalo plain, but it was fabric at Hobby Lobby’s. Yours looks so festive. I think your place looks terrific! Very warm and inviting! Great job!!!! Gosh, I think your front porch decor looks dynamite! I love the graphic red and black buffalo check combined with the simple greens. It has visual impact and looks festive yet “natural”. I think your decorating style always looks inviting and genuine – and just in good taste. I love the elements you combine for a very attractive look. I bought one of your pillows once from your Etsy shop (It has antique red embroidery on the front and red and white ticking on the back) and I love having something unique and beautiful in my house that you created! It joins my Christmas decor and looks nice then, too! Thank you for sharing your beautifully styled house with us during all the seasons. I think it’s just perfect. Merry Christmas, Ann! During a season that is supposed to be about serenity, your tasteful decor is a breath of fresh air. Such a warm and welcoming front porch. Very fresh and love the Buffalo Plaid! Feeling inspired. Thank you Ann! I know what you mean about the houses we see featured on different blogs. There is another group of people, me included, who look at your decorations and are envious. I just try to get over it and realize that there would be another group who would love to have my little condo with my much loved decorations. I like the fact that you realize there are others who are not as fortunate as you and I. Some bloggers seem to have no feelings except for those on their social and economic level. Merry Christmas to you and yours. I love your plaid pillows. I went to JoAnn’s a few days ago to find red buffalo plaid fabric but had no luck. I did look at the plaid shirts you bought from Amazon. Thanks for the information. Hi Francis…the plaid flannel has been sold out at Joann for a while. I went myself over Thanksgiving and it was gone. Another reader said they found some at Hobby Lobby but I have not seen it there. Merry Christmas! Now take a second and give the famous pouch a red/black buffalo scarf or bow tie. Keep up your good words and sharing things that we really can use and do ourselves—-I love receiving your posts! I know Jeannie…rarely what you see is the real thing. For more years than I can count I have wanted to be featured in a magazine. This past year I was able to finally let go and move on to other goals. It’s not going to happen and even if it did, it wouldn’t be “my” home. Thank you for your comment and for visiting. Merry Christmas! Ann, you are echoing my sentiments exactly. I love to decorate for the holidays, but I would have my husband abandoning ship if I tried to create the complicated holiday decorations that I’ve seen in blog land. But you’re right, sometimes it leaves one feeling a little inadequate. Your porch is so cute, simple and do-able. I know lots of people will appreciate the inspiration. Personally, I would love to have a porch big enough to have at least one rocker. Cheers! Thanks Ann i love your porch,now i need to see if i can do as well. Thank you Ann for a straight forward beginning above. Not all of us can afford many of the ideas we see online or live in the ‘perfect’ home often shown. I have taken many of your beautiful ideas and recreated them in ways that are within my budget and as you say are very welcoming and comfortable. Thank you for sharing your ideas and your home. Have a wonderful Christmas! Dear Ann, I love that you put into words what many feel while viewing all the beautiful Christmas home tours. Our home should be our cherished dwelling and not in competition with any other home. Love what you have and enjoy it to the fullest. Your porch is beautiful and perfect. Love your plaid shirt pillow covers!!!!!! I love your porch….simple but elegant. 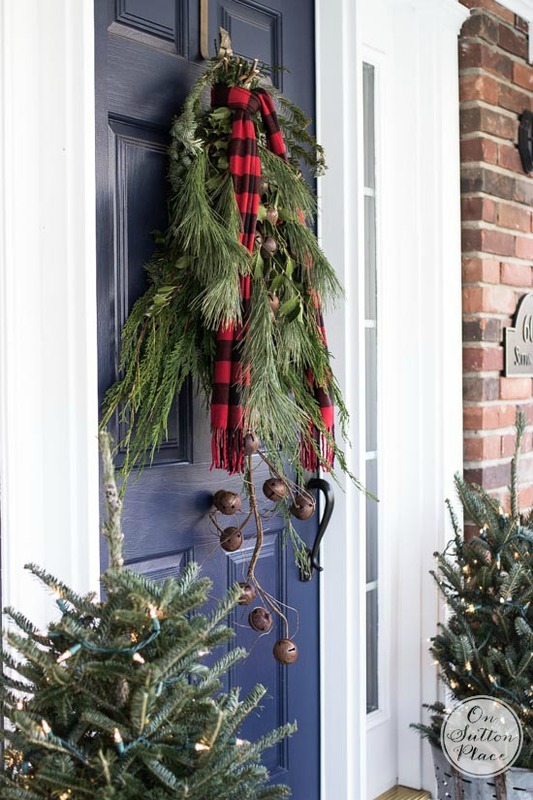 The door hanging is wonderfully done…..nice touch with the plaid scarf….Have a great week!!! I looooovvvveee the way you are doing things as I don’t have funds for spending like others do!!! makes me wish for more space. I love my blog family – so many great ideas but I thought maybe I was the only one that felt what you were brave enough to put in print. Enough of that. I love your ideas and I’m all about keeping it simple but festive. Hey, your Christmas decorating looks so GREAT! Our Christmas decorating is very simple , yet I am happy with ours. Our Christmas tree is not really a tree, but it is the bundle of branches with homemade Moravian stars. Your ‘5 things’ list is well worth repeating! I use it as a reference seasonally! Your creativity shines through when reusing things in a different way… it’s a much different result than merely throwing objects and CASH at our homes. Keep it up! It’s very inspiring to see a beautiful space that I can recreate with my own things! Your house looks beautiful. I also bought two little trees from Lowe’s last week but I put them in planters. I have the olive buckets and I think I will put fresh greens in them but I wouldn’t have thought of it without you. Thank you. I love the repurposed shirt pillows! Okay, I love the whole porch really! Something you said made me laugh…your blog is one that I envy! Well, not envy really, but want to copy! I clicked through to your tutorial and the story you shared made me cry! (Comments were closed there so I’m sharing here.) Thanks for being an inspiration! Ann – I love the simplicity of your decor, especially at this time of year. It looks wonderful, and lets the message of the season shine through. Keep up the great work! 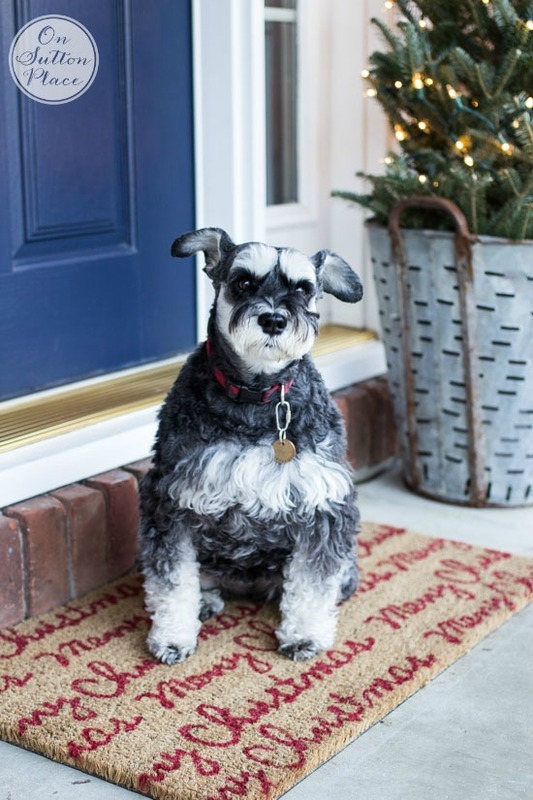 Ann, a simple and yet stunning front porch welcome! Next year my New England porch will hopefully be as welcoming with perhaps the addition of a sled or pair of skis! Thanks so much for keeping the holidays humbling????! Merry Christmas to you and yours! Your porch looks beautiful! Very festive! Love your comments about “perfect” holiday decor. I, too, have come away from those pictures feeling a bit down. Thanks for putting into words what THAT’S all about! Hmmm…I wonder if some of these gals go out & buy the decor, snap their pics, and then return it all. If not, you’d need a warehouse to store it! I LOVE that so many of my Christmas decorations were my mother’s (and grandmother’s! ), or gifts from cherished friends. Unpacking the bins is like taking a trip down memory lane. Thank you, Ann, for putting it all into perspective! The front porch looks so festive. My favorite touch are the shirt pillows. And of course your model. I so appreciate your frugal Christmas ideas. You have such an eye for simple things that look just beautiful. I’m in my 70’s, and I just don’t want to spend hours and hours decorating the house to the nines, only to spend hours and hours putting it all away. The money is not so much an issue as is the energy it takes to do it all. A funny thing is that since my knee replacement, I can no longer get down on my knees to crawl into the cubby hole space where in the far back, 70’s and 80’s Christmas things are stored! And I thought that was such a good place for storage! Ha! Loved the quote and your charming little greeter. Your porch is so pretty Ann. I love the black and red check. Im doing easy this year too. We may not even get a tree. I actually know people who have their homes professionally decorated for the Fall and Christmas; picture perfect, yes, but empty memories. Sometimes simplicity speaks volumes, your front porch is all heart. Ann, your porch is beautiful! I love the natural elements used. I, too, have been a little overwhelmed with all the perfection I’ve been seeing in blogland decorating. I just don’t have the energy or desire to spend days and days decorating, nor do I want to spend all the money to do it! Your decorating style is classic and gorgeous. As I scrolled down, reading your post, I loved seeing the picture of your precious schnauzer. We recently lost our sweet Lulu unexpectedly, and she looked so much like your baby. Merry Christmas! Ann! This is exactly why your blog is my favorite. My husband is retired from the ministry and is teaching school. We are determined to not stretch ourselves just to have something more high end than a friend or neighbor, but to capture the spirit of the season. I LOVE this front porch as much as I love my back screened porch, which is decorated with previously loved things and thrift store finds. You are amazing; thank you for sharing this today. Beautiful Ann! Your front porch is always so lovely and welcoming! I like what you do and how much, enough to be pretty and to show you care versus some other bloggers who show no orginality, they just buy up a pre-made craft store department and fill up their rooms. Sorry, my tone is snarky- my parents raised me better. I prefer non-made-in-China decor (terrible labor conditions and our nation’s trade imbalance issues). Pinecones & your lovely greenery are perfect. You are so right! Yesterday was our 32 annual Christmas House Tour and it was amazing seeing 6 beautifully decorated homes. Then I came home and was feeling ( where do I start) overwhelmed! So this morning I read your post and will start with the porch and then go from there!!! Thank you!! Sue Horn from Island Heights, N.J.
Sue I totally know how you feel…that exact thing happened to me after a Home Tour event 2 years ago. I came home and had no idea what to do. You are right to just dive in…start somewhere and the porch is as good a place as any. Enjoy the holidays! I’m so happy you talked about the “Perfect” homes – I decorated my home for Christmas and after looking at some of the blogs I follow – I was a bit depressed at how my place looked – I tried to tweak it, but it just didn’t look quite right. Thank you for reminding me why I started my blog in the first place. We all need a reminder once in a while Rose…happy holidays to you! Love the porch decorations Ann. 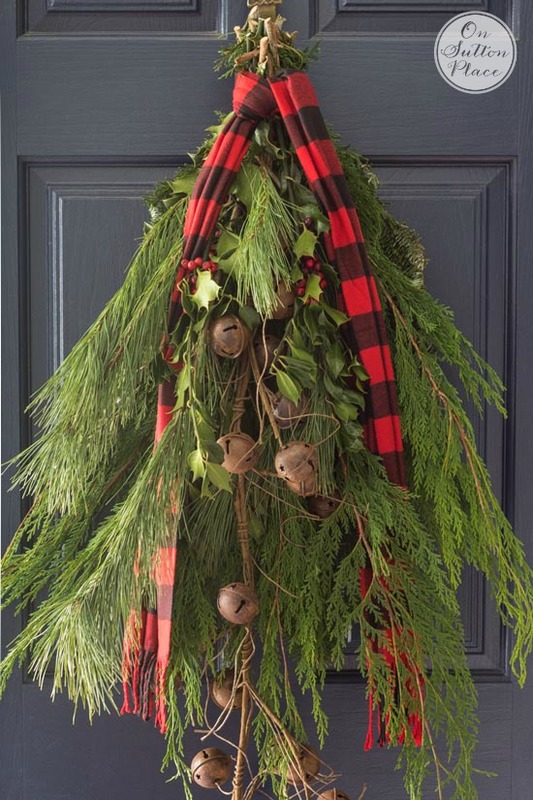 The door swag and trees look great.and I am crazy about red and black Buffalo check fabrics. I just want things simple and real this year. To me it is more cozy and welcoming. Don’t try to compete with other’s and just do what you love and that makes you happy. Like you said you can get a great look without spending a fortune. Very interesting thoughts on comparison and stress. I enjoy your warm and loving blogs. Remember perfect spoils good. You are GOOD. Smiles. Ann, yours is the only blog I subscribe to. I look forward to all your posts and projects because they are realistic, reasonable and creative. Keep on keeping it real!! JOY! You got it all right! Ann I love how you are so authentic!! Sharing your sensible ideas is so refreshing!!! I love the porch!! Can you tell me where I can purchase the Olive buckets? Also what is the site for the daily deals! Thanks again for all of the awesome ideas. Hi Nancy! 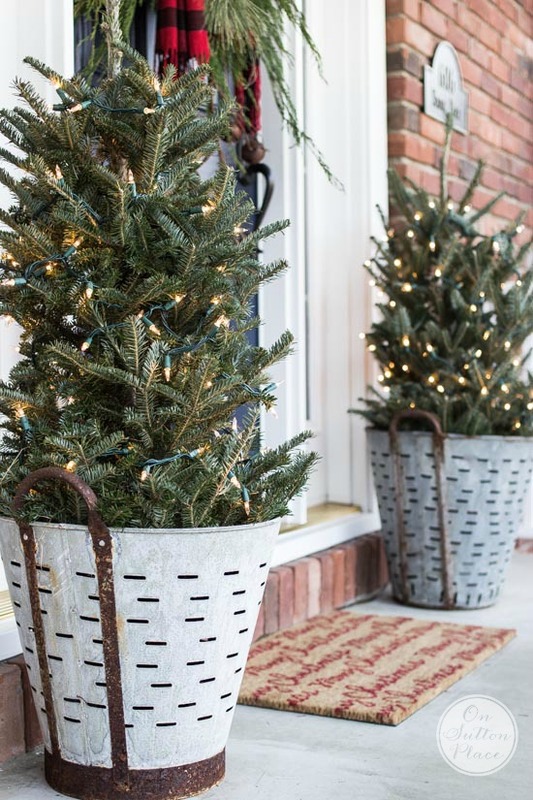 The olive buckets are from Decor Steals. You can sign up for their emails at https://www.decorsteals.com/. The olive buckets aren’t available now but I bet they will bring them back at some point. Ann, you don’t ever have to feel like your home can’t compete. I truly appreciate your style and use of color. Being in the same age group as you, I still love the traditional Christmas themes. All of the neutral looks just don’t do it for me.Reds, greens, plaids, checks…bring ’em on! Merry Christmas. I look forward to your blog in the new year. Thank you, Ann, for these words! I’m not a blogger, just a decorating and DIY’er enthusiast. 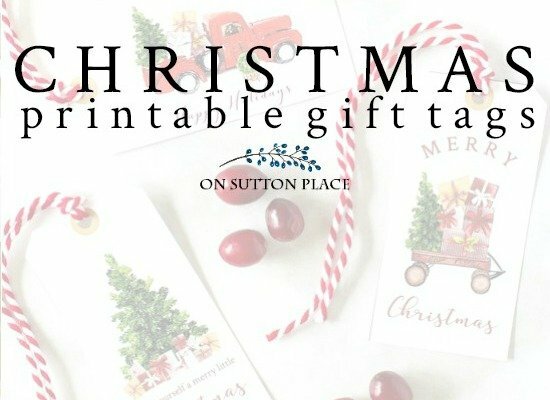 It’s so comforting to hear that I’m not the only one who comes away feeling disheartened, inadequate and overwhelmed after browsing through some of these Christmas home tours, with all the over-the-top decorations in their picture perfect homes. It’s kind of same feeling I get when I watch some of the Hallmark holiday movies…the ones that are supposed to make one feel all warm & fuzzy. I typically end up feeling all sad and teary-eyed. I love your blog and what YOU do, Ann. I’m a firm believer in “keeping it real” and I believe that’s why I’m such a fan. Thanks again. I forgot to add…I actually cut branches off the BACK of my Christmas tree to decorate with. One side of my tree is against a solid wall….and now it’s had a little trim…no cost for my decorating greens! I love your style, Ann, and want to thank you for sharing your tips and tricks with us. 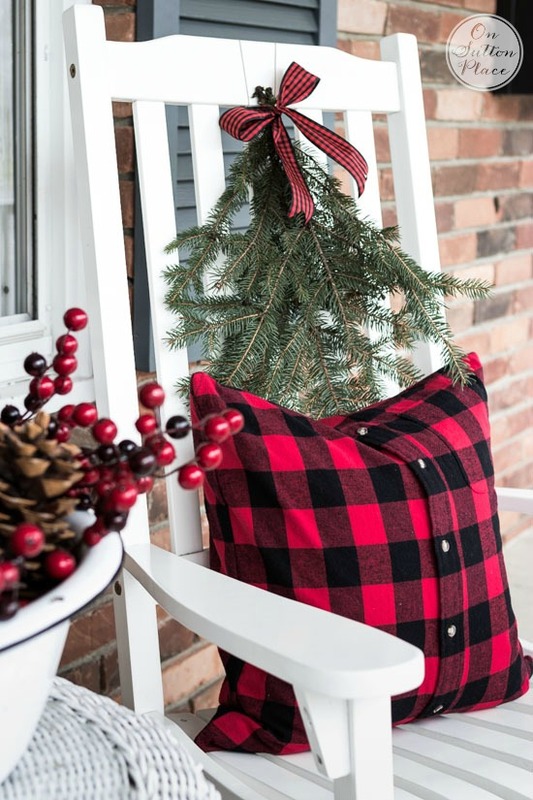 A few weeks ago when you first showed your front porch I set out looking for buffalo plaid and although I struck out, I was able to find tartan plaid and just love how it turned out. I made envelope back covers for 4 summer pillows on my front porch, got some greens, a lantern with a battery operated timer candle and fell in love with my porch! Thank you so much for your inspiration. I love your shirt front pillows – what a great idea keeping the button front. I will have to keep that in my memory banks for the future. What a fabulous post! I do agree with issues of the picture perfect blogs..I don’t even see how bloggers have time to create these beautiful weekly vignettes and have a regular life too. I love the realness at On Sutton Place and hope you will continue to inspire us with the great posts you provide. Firstly, I love the Roosevelt quote, it’s a good one for this season! Your porch, as always, is lovely! The pops of red are definitely a Christmas must! Just wondering if you will plant your lovely new pine trees? Too cute! I saw one blog from a young housewife – brand new house, beautifully and professionally decorated, gorgeous pool with outstanding patio furniture. She even had two laundry rooms – one on the first floor and one on the second where the massive bedrooms were. How do these people afford this kind of life?!! I love what you do on this blog. All the crafts are simple but beautiful. Your recipes are very good, and the decorating ideas are just what I like to see. I cannot say enough how much I love your blog and always enjoy seeing a new post. Your porch looks great! I love all the little touches you added, it really makes it stand out. Great idea on the pillows. Thank you for making your decorating ideas feasible for every budget. Good Morning Ann. 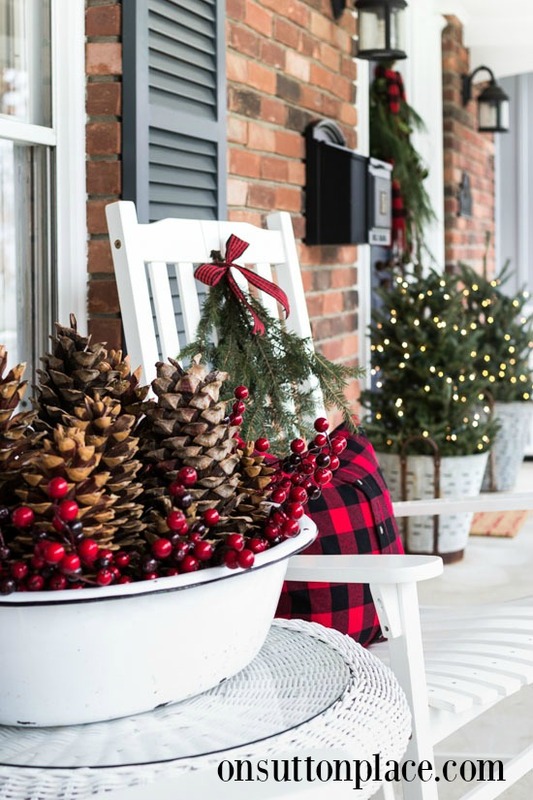 Your festive porch is inviting just as all your seasonal decorative porch inspirations. The red buffalo print pillows are the icing on the cake. I hope our December’s weather follows the likeness of November’s weather here in Ohio. Cutest Christmas dog pose.